After watching the Bend Oregon Outrigger Canoe Club practice in our local Deschutes River and observing the power, speed and fun the OC-1 paddlers generate I had to step off my standup paddle board for a try. Hooked! After just a few weeks of OC-6 team practices I love the sport – and even more, I love what it has done for my SUP technique. While going fast and training for endurance is important, keeping injury-free while getting the most power from each stroke is a top priority. Like many of you, I get some training from clinics and pros when possible and make the most of YouTube videos by athletes and trainers we respect. 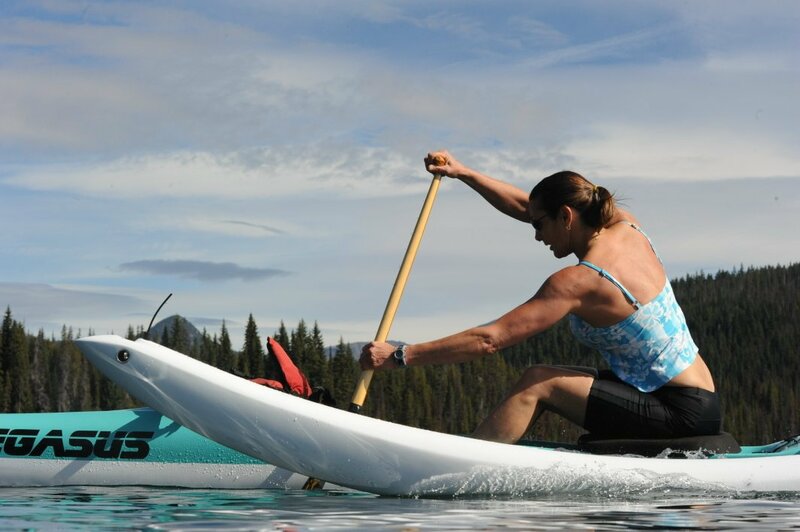 I actually had to get a sore shoulder in order to learn some key aspects of the outrigger paddle technique. 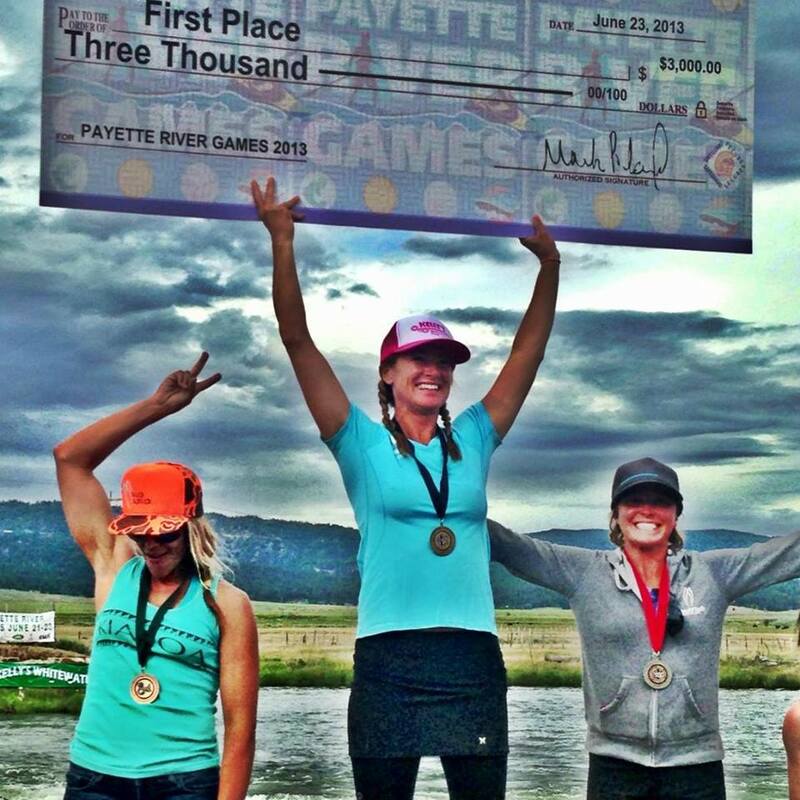 In seat 2 one afternoon I sat behind a super strong paddler and a KIALOA Paddles ‘Elele, Jen Kjellesvik (Standup paddle and Payette River Games podium winner). On each reach before the catch it seemed to me that her elbow and forearm set higher than the shoulder – so I mirrored that. The imagery of power I got from Jenn in seat 1 made me feel fast and strong – but my upper arm and shoulder felt fatigued and sore. I chalked that up to using new muscles. 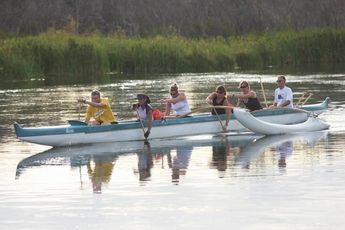 Later when we switched out of the canoe for some dry land training with coach, Meg Chun, we were working on the set/hesitation and catch. One by one we showed our technique – and I showed the way I had done the stroke during practice. “Whoa!,” said Meg. It seemed that what I thought I was seeing from seat 2 was not what was really happening. Jen’s FOREARM and hand were above the shoulder (set-hesitate for that nano-second before each catch) but the elbow floated below the shoulder. Just as I knew from standup technique, to keep my elbow below the shoulder, the same was true for outrigger. Meg’s training and explanation in the dry land clinic really brought this solidly home. Thinking about setting the scapula, images of bracing with the leg and pulling on a door handle, and repeats of a hesitation before the catch gave muscle-memory to this shoulder-happy technique. 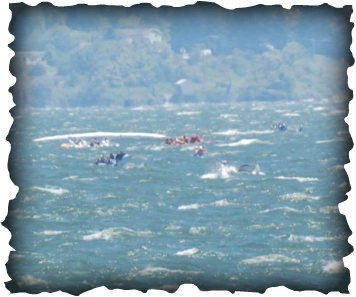 A second lap in the OC-6 gave a chance to practice the technique – but a surprise bonus in imagery came paddling by. Team mate, Lisa Jabukowski, came past in her OC-1. For a few minutes she was off to my right. I watched her upper body through dozens of strokes and noticed her shoulder/back position before each catch and pull. I can’t describe exactly how her rotation was different from what I had been doing but watching her allowed me to make subtle changes. Everything about my stroke was feeling better and nothing was getting sore or unduly fatigued. The next time I was in the water after that clinic I happened to be standup paddling. With outrigger imaging in my mind I kept my bottom arm straight and my upper elbow below my shoulder on the recovery. HESITATION, set and DIG for a solid CATCH. Then using my legs and torso rotation I moved my board forward as the paddle held steady and smooth in the water. Again and again, 8 strokes per side, for about 4 repeats I went slow and with focused intention. Then it was time to see what a bump in cadence might do. Sweet! There was an absolutely cool connection between the power in my legs and the rotation of my torso – which moved my shoulders to the proper plane (thank you, Lisa). I could feel the moment of catch before my legs enhanced by body rotation solidly ooooonched my board forward and past my paddle. Next day shoulder soreness = NONE!! Muscle memory, great imagery and some solid coaching provided in the outrigger team setting is making a world of difference in my standup technique. If you have a chance to participate in both – give it a try.